What is a Bald Spot on Your Head? The dreaded bald spot. Perhaps the most stereotypical of all hair loss conditions. It’s often depicted in popular culture as the most common form baldness and a sign of the onset of middle-age. This is, in many ways, an unfair characterisation. Bald spots seem severe and, in many instances, they are. But, more often than not, they are treatable, especially if addressed early. The truth is that bald spots are an effective warning sign – wake-up call even – for men to take their hair and its care more seriously. Your hair might not be around forever, especially if it’s not taken care of, and treated like the organ it is. What Is A Bald Spot? 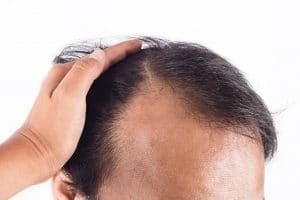 A bald spot is a small area – often circular or ‘spot’ shaped, although it can manifest itself in more unusual forms – of total hair baldness on the scalp or elsewhere. In other words, the hair follicles underneath that area refuse to grow hair. Although it can occur in women, it is more common and noticeable when it affects men. Men who develop bald spots, perhaps in part due to the associations with bald spots from negative portrayals in culture, typically feel a host of negative emotions. There are many obvious, and some not so obvious, causes for the sudden or gradual onset of bald spots. Far-and-away the most common form of bald spot comes from alopecia areata. Thankfully, it’s also one of the most treatable and least severe forms of alopecia. Ironically, another term for alopecia areata is spot baldness. There’s a whole host of reasons as to why a man might contract alopecia areata. Some of these can be prevented, others are, unfortunately, down to predisposition. Genetic predisposition: almost all men are, to a certain extent, predisposed to some level of hair loss. Fortunately, bald spots are a very minor manifestation of alopecia. In fact, they’re extremely treatable. At Advanced Hair Studio, take one of our complimentary advanced hair checks and we’ll be able to provide you with the right guidance for treatment options for your bald spot. Some of our industry-leading treatments include our Advanced Hair Fibres, Laser Hair Growth Treatment and our world-class Strand-By-Strand technology.